Our state has also implemented Teacher Effectiveness and with being a "specialist" I can't always create the parent communication and the motivation from my students allows them to work toward their academic and behavioral goals each week, not to mention the retention of scientific information. As a mother of four, with two in college, I can't always spend a ton of money on prizes and treats and I don't really like the idea of "buying" good behavior. So, going back to Teacher Effectiveness...I needed to find ways to continue to make connections...motivate my scientists...and create positive communication! Brag bracelets are a positive incentive system that will be used to create an inexpensive reward that will celebrate and promote positive academic and behavioral classroom goals. How will students wear the bracelets? I will be watching for positive behaviors as well as encourage students to focus on our goals. When I see a student exhibiting something to brag about, I will take a bracelet and place it on their wrist. You can either glue or tape it on. It is important to share with everyone why the student earned the bracelet! Will you keep track of who earns a bracelet? I will not be keeping track of who gets one. Our school is at 82% free and reduced. Many of our students need all of the positives they can get. They also need to be motivated as well as find ways to motivate themselves. Just like any behavior plan, at times some students need more encouragements while our leaders also need to be celebrated, too! Keeping track of over 400 students with only having one hour with them a week could use up way too much of my time when I need each and every minute for teaching. I am storing them in a word chart. Each bracelet fits perfectly in the pocket. I am printing up quite a few so that I am ready to go the first day of school. I will not give any student a bracelet if they ask for one...just like we don't give any student a PBIS behavior ticket if they ask. 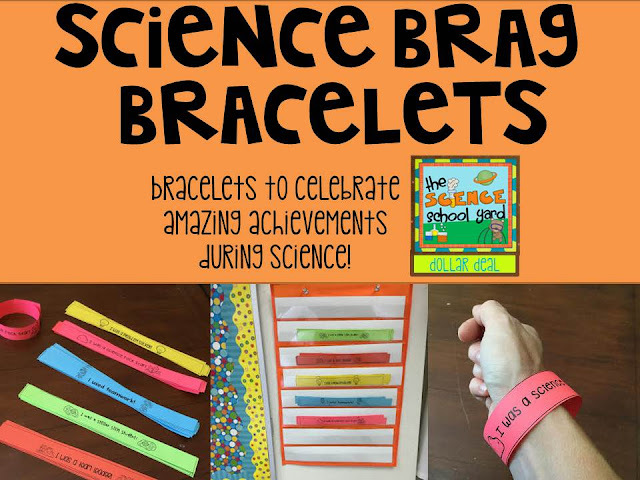 I thought about why this method will work better for me than the coupons that our PBIS team wanted us to give out...bracelets have a better chance of getting home so that parents can see how they are doing in science! Ready to try science brag bracelets? Here is a free copy of my brag bracelets that will be for sale in my TPT store. Enjoy getting your students motivated in YOUR science school yard! Let me know what you think...leave a comment to share the love! I don't like buying good behavior either. Personally I love Whole Brain Teaching. We are 100% Free lunch and it has worked wonders on my challenging students. Love the idea of Brag bracelets! What a great idea! I love how even as a specialist at the school you're able to also use brag tags. Great way to focus on positives with the kids! I'm sure the kids love these! Goes perfectly with PBIS! These look great! Our school is looking into PBIS for next year. I bet these are very motivating!